They don’t call New Mexico the “Land of Enchantment” for nothin’, that’s for sure. I fell in love with New Mexico while road tripping across the country four summers ago. The vast skies, low hanging clouds, chile ristras, local artisans, + contrast of desert vistas to the rugged Rocky Mountains had my heart in an instant. In fact, a major perk of moving to Denver recently was/is being in driving distance to New Mexico. Will and I had been itching to get back there for a while now, and were finally able to make it happen a few weekends ago. We first did a quick jaunt through Santa Fe. Highlights included roaming the historic Santa Fe Plaza, tea at Opuntia and exploring the La Cieneguilla Petroglyphs & the Tsankawi Ruins. Probably our favorite part of the weekend was staying off the beaten path in a cabin at the Taos Goji Eco Lodge & Farm. For those unfamiliar with New Mexico, Santa Fe is about an hour and a half from Taos. We found this gem of gem on HipCamp just a few days before. It was absolutely majestic, rugged yet clean, rejuvenating, and inspiring. 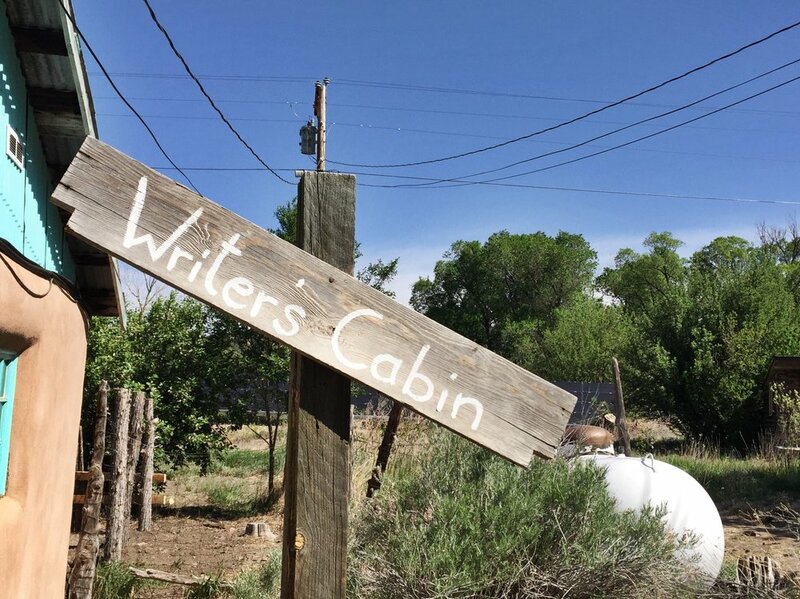 Nestled in the Sangre De Cristo Mountains, this farm holds charmingly rustic, fully furnished log cabins amidst forty acres of goji berries (among other fruits and vegetables, fresh eggs and animals including goats, alpacas and chickens). When we arrived, we instantly befriend the resident turkeys. Did you know turkeys purr? Me either... ‘til meeting this big fella. It turns out that D.H. Lawrence owned property down the road from here many moons ago. Like...during a 1920’s moon. Some of the cabins were built at the beginning of last century, apparently used by sheepherders. According to the original owner of the Goji Farm, D.H. Lawrence would occasionally stay in one of these cabins. English writer, Aldous Huxley, also lived and wrote in one of the cabins. …and built in outhouse that is still in existence. The current owners have found watercolors by D.H. Lawrence, as well as letters written between himself and his wife, Freida. The majority of the cabins have a full kitchen, bathroom, wood-burning stove and artisan touches that pay homage to the indigenous tribal history of the Taos Valley. The owners, Elizabeth & Eric, are incredibly gracious. FUN FACT: we accidently booked our cabin for the wrong night (Sunday instead of Saturday; oops), but fortunately there was an extra cabin available that Saturday night, and Elizabeth not only made it work, but left us with a half a dozen fresh eggs from the chickens. The next morning, Eric gave us a tour of the land and communal kitchen area known as the Cafe & Trading Post. He even gifted us a jar of goji berry leaves to make our own tea with! After we said farewell to the chickens, hens, and alpacas, we headed to the Rio Grande Gorge Bridge and did a quick hike (actually away from the bridge, into the desert). The Rio Grande sure is grand! This bridge is apparently the seventh highest bridge in the United States. Will and I are adventurous, but honestly: we don’t meticulously plan our weekend explorations. We do things on a whim and often share the best experiences when they are unplanned. Don’t have time to plan a big getaway weekend...but need a getaway? Santa Fe is a good six hours from Denver. We left 5:00am Saturday morning. Not all of our weekend ventures are this far, but it’s always good to get a jumpstart to the day to avoid traffic and pack in as much as possible. I’m lucky that I have friend who not only lives in Santa Fe, but has actually written local guides to Santa Fe (what?! I know, that’s the best kinda buddy). It’s always good to connect with a local, even if it’s a friend of a friend. We met an amazing groups of WWOOF’ers when we first arrived at Taos Goji Farm, and they are the ones who told us about the Rio Grande Gorge Bridge. If not for them, we might have ended up in a tourist trap in Taos. Roadside ristras, fresh eggs that ended up being our breakfast, an ice cream bus ---these are all things that we totally did not plan, could not have planned, but made our trip so much more memorable, worthwhile, and downright delicious. I’m looking forward to sharing more of our weekend warrior-ing with you here on BETTERISH. This trip in particular was special. New Mexico is truly a treasure. Georgia O'Keeffe once wrote, "I never knew I was looking for a spiritual home until I came to New Mexico."